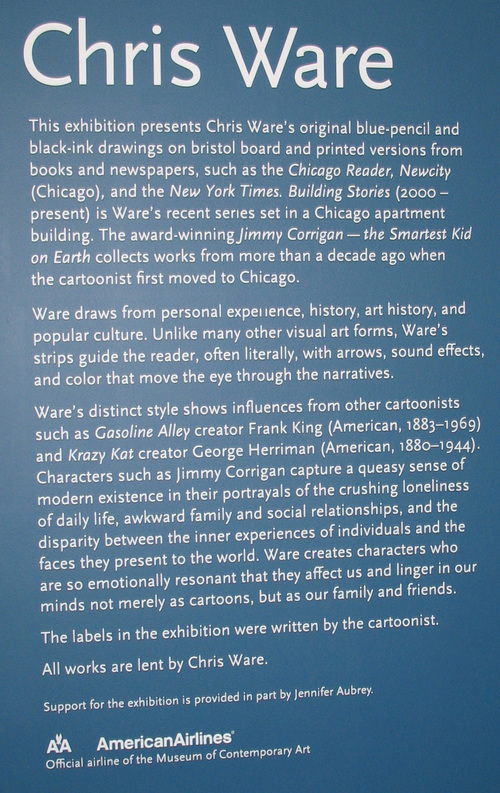 Stumbled by complete and happy accident into the Chicago Museum of Contemporary Art where the second floor was dedicated to exhibiting the original comic pages of Chris Ware. Made me immediately think about Roy Lichtenstein - half a century ago, basically recreating comic book panels and having them widely regarded as fine art. Struck me as a bit amusing that it took another half century for actual comic panels to be regarded the same way. Don't know if it was because of the Ware exhibition or not, but the gift shop was awash in contemporary illustrator/artist wares from the likes of Baseman and Biskup. It's probably remarkably uncool, but I've posted a photo gallery of shots taken (mostly) by my son, John Z. during our Chicago trip. Wish I were near to Chicago, Zimm. I love Ware's work, and can stand in the Brookline Booksmith for hours browsing through books of his stuff. I was pissed when the NYT Mag discontinued his funny page. What's up with that?